Today we are announcing the availability of StorSimple Virtual Device Series in the new Azure portal. This release features significant improvement in the user experience. 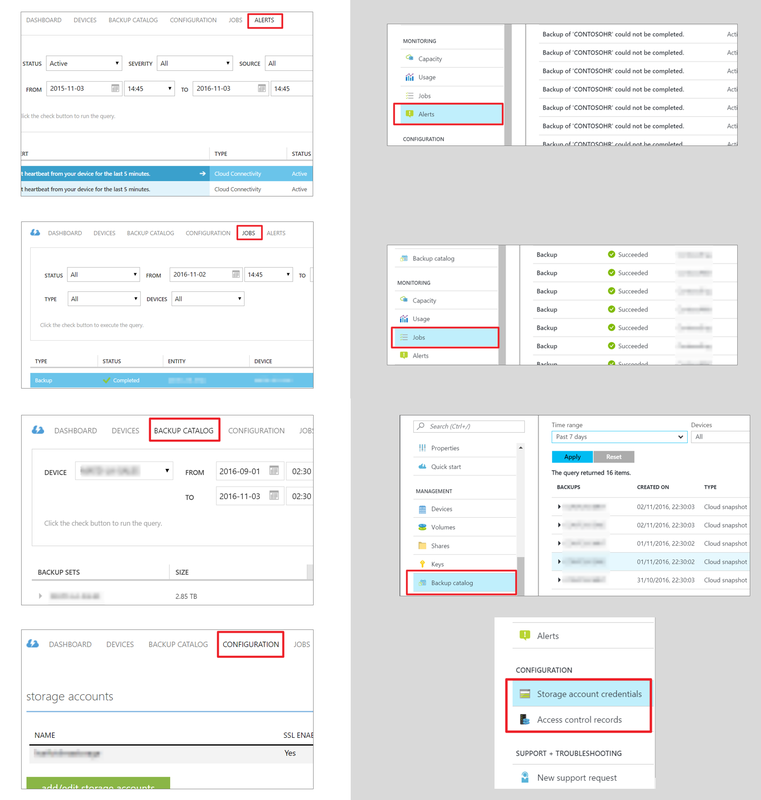 Our customers can now use the new Azure portal to manage the StorSimple Virtual Array configured as a NAS (SMB) or a SAN (iSCSI) in a remote office/branch office. If you are using the StorSimple Virtual Device Series, you will be seamlessly transitioned into the new Azure portal with no downtime. We'll reach out to you via email regarding the specifics of the dates of the transition. 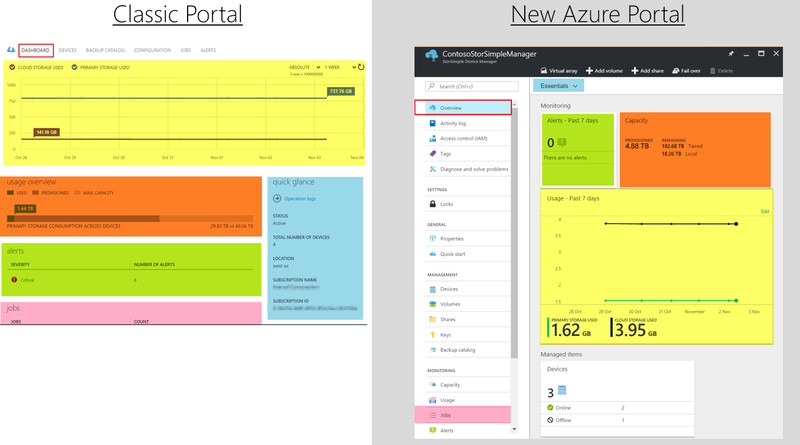 After the transition is complete, you can no longer manage your transitioned virtual array from the classic Azure portal. If you are using StorSimple Physical Device Series, you can continue to manage your devices via the classic Azure portal. 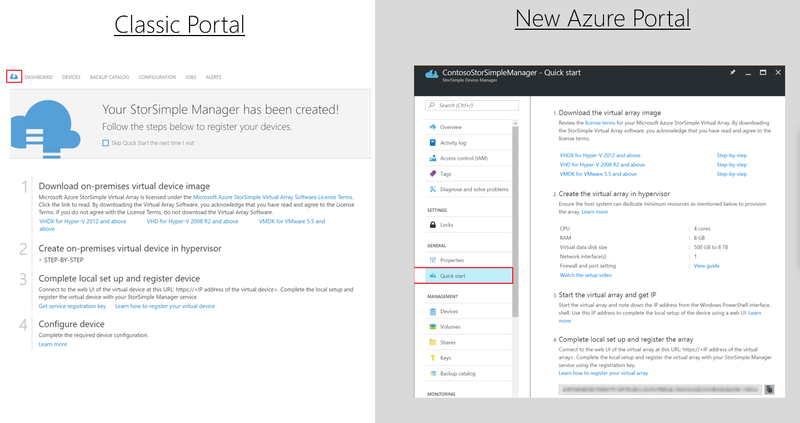 Learn how to use the new Azure portal in just a few steps as detailed below. Everything about the StorSimple Virtual Device Series experience in new Azure portal is designed to be easy. 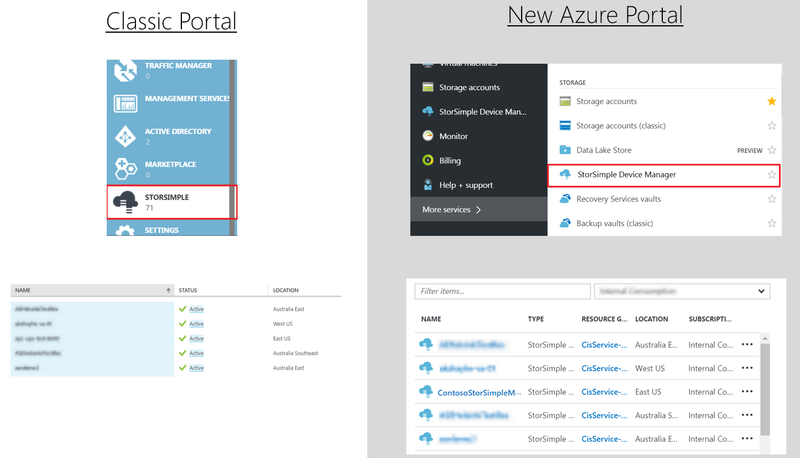 In the new Azure portal, you will find your service as StorSimple Device Manager. The Quick start gives a concise summary of how to setup a new virtual array. This is now available as an option in the left-pane of your StorSimple Device Manager blade. The StorSimple Device Manager service summary blade is redesigned to make it simple. Use the Overview from the left-pane to navigate to your service summary. Click on Devices in your summary blade to navigate to all the devices registered to your service. For specific monitoring requirements, your can even customize your dashboards. Click on a device to go to the Device summary blade. Use the commands in the top menu bar to provision a new share, take a backup, fail over, deactivate, or delete a device. You can also right-click and use the context menu to perform the same operations. The Jobs, Alerts, Backup catalogs, Device Configuration blades are all redesigned to ensure ease of access. For more information, go to StorSimple product documentation. Visit StorSimple MSDN forum to find answers, ask questions and connect with the StorSimple community. Your feedback is important to us, so send all your feedback or any feature requests using the StorSimple User Voice. And don’t worry – if you need any assistance, Microsoft Support is there to help you along the way!